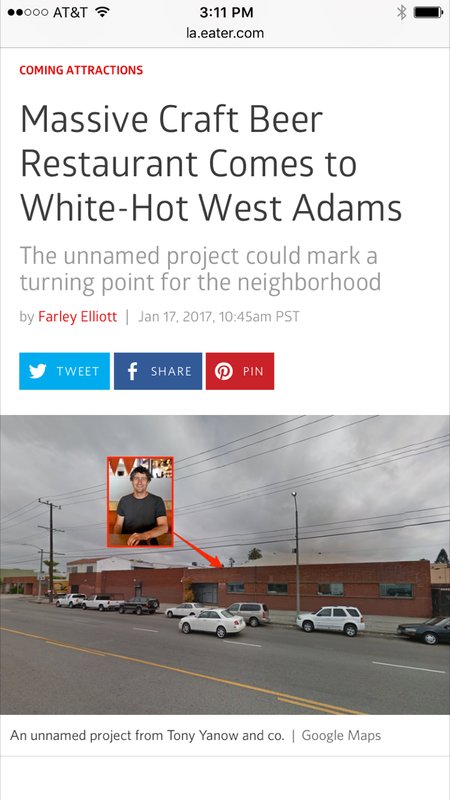 THE UNEMPLOYED EATER: West Adams Is Getting A Massive Hipster Beer Bar. West Adams Is Getting A Massive Hipster Beer Bar. If you missed the good gospel, I moved to West Adams a few months back. While I adore my new community, it is lacking in the food and beverage department. There have been rumblings here and there, including a sandwich shop on my very corner, but nothing concrete. Until now. Farley Elliott, bless his heart, breaks news today one of the city's finest bartrepeneurs (that is not a word; I totally made it up and it isn't great, but whatevs...) plans to open a MASSIVE craft beer hall in West Adams. A mere one and a half blocks from my domicile. I literally did a Tiger Woods In His HeyDay Fist Pump upon reading the news. It's HUGE. I got so excited I immediately personally checked out the location in hopes it would crack its doors ajar very very soon, but it appears to still have the For Lease sign with very little indication of work done inside to convert what appears to be a former warehouse of sorts into my future watering hole. So, for now, the WAIT BEGINS. And it's excruciating. Yet, ever so thrilling.